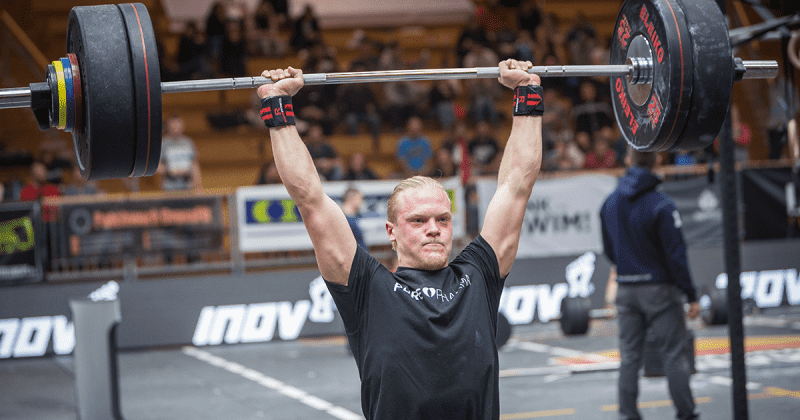 Front squat turned to push press, say hello to thruster and a very popular exercise that will definitely appear in the upcoming CrossFit Open workouts. What do Kalsu, Fran and Jackie have in common? Quite a big amount of thrusters. Insufficient front rack mobility is a common reason why so many athletes struggle with either front squat or thruster. The bar needs to rest on your shoulders, you should look for a “comfortable” position which feels strong and where your arms only control, not carry the bar/weight. So if your torso is upright, your shoulders, wrist and arms in general need to be mobile enough to only control the position of the barbell. Until the top position of the squat, your torso carries the weight. Avoid touching the bar only with finger tips; grab it with a hook grip. If this is impossible, make it manageable with mobility drills. Also regular work on front squats will eventually improve your rack mobility as heavier weight will force you to hold the bar in a better, more efficient way. Inappropriate rack position, limited overall mobility and leaned-forward torso will cause the bar to start slipping off your shoulders. Fixing it during the WOD will therefore cost you extra strength and energy, and also disturb your focus. In the bottom squat position your elbows needs to stay up, whether doing front squats or thrusters. Focus on keeping the bar fixated well on your shoulders, and be accurate with receiving it in this position as well. Rather slow down the tempo and perfect the movement, the speed up and lose control. Weightlifting exercises should look perfect and well controlled. So if your regular training shoes feel to “soft” to keep you in a solid position, put on the oly shoes. Hard, solid heel will help you stay balanced throughout the movement. Trying to keep balance doesn’t just cost your extra energy and focus, but also increases the risk for a potential injuries. No balance, no control. You might go unbroken for the first round, but you’ll definitely broke down later. Thruster is a metabolic conditioning exercise which needs proper pacing and smart approach when being done in higher amount of reps. Take a rest even if you feel your tank is still full. Never forget there are at least 4 more rounds ahead. Be accurate with standards for valid reps. Extend elbows on top, reach below parallel on the bottom. Thrusters start with cleaning the weight into the front squat position. Clean directly into the squat, don’t power clean it. If you have issues with that, you have to strengthen the cleans: to solidly, confidently receive the weight in the bottom, front squats position. In the following video Barbell Shrugged team talks about thruster tips for Fran, where they break down the mobility, technique and pacing.